If your worried or anxious about having to speak in public or you just want to master the are of public speaking then you may feel relieved to know that nearly all of the top public speakers were in your shoes once and most of them were once bad speakers. Most people dread public speaking, some get crippled by the intense fear of it and the mere thought of having to do a public speech can terrify normally strong and confident people. For most public speaking is stepping out of their comfort zone, the key is preparation both physically and mentality, because you can do all the preparation you want, you can go over things again and again, you know your topic and you have done everything you possible can for your preparation. You know you are capable but as the moment gets ever nearer the nerves and the anxiety starts to creep in and by the time you are about to deliver your speech you become paralysed and overwhelmed by fear. Sometimes you can apply all the best advice available, read all the information and tips but your subconscious mind trips you up at the last minute. Instead of enjoying your speech with excitement and engaging with your friendly audience your mind and body are preparing you to fight or run away from a pack of angry lions. Public speaking is one of the biggest fears a lot of people have to face, it can fill you with dread days, weeks or even months before you have to step up on the podium. Public speaking is can be the ultimate fear of being the centre of attention. It can evoke fear of ridicule, embarrassment and making a mistake, freezing and forgetting your lines or saying the wrong thing. Even the hardened of professionals can still feel anxious before they are about to address the waiting crowd regardless of how many times they have done it before. Although it is said a little bit of adrenaline and stress should be used as your fuel you don't want to be crippled with stage fright. But it is not just giving a long presentation in front of a large audience that sends people all into a quiver and turns them into a nervous wreck. There are many other forms of speaking to a crowd that can prove very daunting to the majority of people, such as having to give a best man's speech, a work presentation or even just speaking up in front of a smaller crowd at a social gathering. Preparation is a good place to start, be familiar with the room or environment before hand, try and make yourself look presentable in the way you dress, know your subject off by heart, make sure you do your research on the topic you intend to talk about. Try and memorize your presentation so you don't have to read it off a piece of paper. Be yourself, remember no body is perfect so don't worry if you make a mistake just keep going, keep eye contact with your audience and make sure your subject and information is relevant to the audience, if possible add some humour to your talk and try and have some fun as you engage with your audience, many advise to also add in the odd story here and there. Some suggest you practice in front of a mirror before hand or even do a dummy run in front of a few family members or friends first, however some experts disagree with this however because they claim it takes away the rawness and naturalness of the speech or presentation. Make sure all your equipment is working before you start and arrive early at the venue so you allow yourself plenty of time to get prepared, it can be well worth the effort to join a public speaking class if there is one available in your area. If you feel anxious be aware of your feelings observe them while staying controlled so you don't get to emotionally involved with them, they are only sensations so acknowledge and be aware how you feel but let the feelings flow through you while you give your main focus of attention onto the task at hand. If you want to master the art of public speaking you need to learn from a professional. 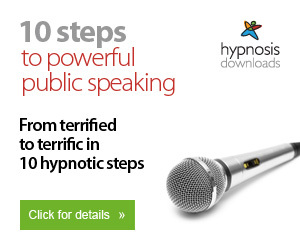 The article below has been written by a professional hypnotherapist and master of public speaking so you will struggle to find better help and advice. If you are interested in some professional public speaking tips and advice you are sure to beneefit from reading this article below. Our biggest enemy in life is fear, public speaking is at the top of the list when it comes to fear, sometimes we need to adapt the attitude of it's not going to kill me so I will do it. We have to be more bold and courageous otherwise we become very limited in want we can achieve.